What to say, what message to send? You like cars? You understand English language and British humor? And you have missed Top Gear?! Go get some right now!!! BBC has gained more popularity worldwide because of this series than anything else including Dr Who in my humble opinion. 18 seasons are aired and like 17 last ones are brilliant. When Jeremy Clarkson, Richard Hammond and James May started presenting cars and all about cars in that time little they known about their future together, but chemistry and some great scripts did their thing. Now, only one person who likes cars and has seen some tv device in their life, and doesnt know about Top Gear is you. That should change especialy now when there is so much content produced. Real Timeline of World Car Industry from British angle, must see. mrWhite: "Jeremy is completely bonkers." Sarah J Morgan: "Was very worried about Richard when he was in that accident :( And still has courage to drive fast offten, i guess its in the blood." anonymous: "cant wait for 2012 christmas special. and please make next season longer, meaning more episodes, more cars..."
anonymous: "BBC TV Top Gear top show, must watch them all and dismiss fact that it is directed really a lot. Chaps are great in every sense and aspect. More, more, more... after edit: Liked Worst Car in the world but didnt like 50 years of Bond cars. Just saying." 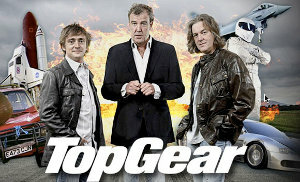 The Stig: "High expectations were in fullness met in first three episodes of this BBC inbound TV gem." anonymous: "more, more give us more. " anonymous: "and so they did, amazing 23. season on way. sunday on BBC, greatest trio since three tenors on tv." anonymous: "Series 21, Episode 1	2 February 2014 Series 21, Episode 2	Alfa Romeo 4C • Gibbs Quadski • McLaren P1	9 February 2014 Series 21, Episode 3	Zenvo STI • Volkswagen Up! • Ford Fiesta • Dacia Sandero)	16 February 2014 Series 21, Episode 4	Mercedes Benz G63 AMG • Caterham 160 • Caterham 620R	23 February 2014 Series 21, Episode 5	Porsche 918 • BMW M135i • VW Golf GTi Mk7	2 March 2014"
sparot: "Great show, in season 22 during 2015. there were Patagonia special and also some seven episodes before Jeremy got stupid and struck some stupid producer at BBC. Since we all know that Jezza can be over the top in his older days, but also has his way of conduct which we all find funny to watch once a week. This does not excuse violent behaviur so apology will be in place, but for sake of huge fan base and lack of entertainment we at sparot hope that long term consequences can be awoided"
Solve this complex math: 8 + 7 = ?